Mr Petroni presenting the wartime shelter sign to FWA chairman Mario Farrugia. 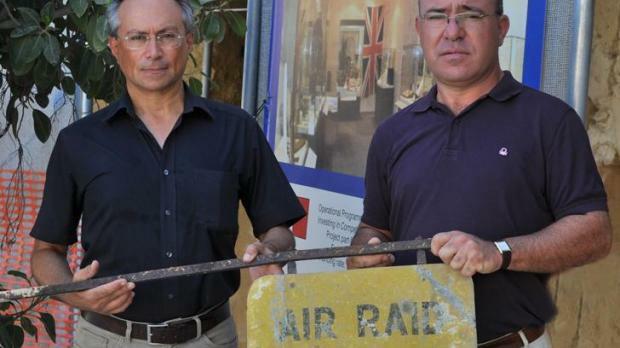 A rare wartime metal air raid shelter sign was presented to Fondazzjoni Wirt Artna by Stephen A. Petroni, a well known Maltese military historian and militaria collector. The wartime sign consists of a wrought iron wall bracket made from a square section bar measuring almost a meter in length and fitted with two small iron flat-bar brackets to which a rectangular zinc plate with rounded corners is attached. The plate measures 45cm x 30cm and retains its original bright yellow livery marked “AIR RAID SHELTER” in black. Originally, this sign stood at the shelter entrance next to the old Naxxar Police Station. Hundreds of these signs were made at His Majesty’s Dockyard early in the war for fixing on top of the main entrance of public air raid shelters. The donated example will be put on display at Fondazzjoni Wirt Artna’s ‘Malta at War Museum’ housed in the lower floor of the 18th century Couvre Porte casemated barracks at Vittoriosa. This museum is currently being revamped and expanded as a result of a €500,000 grant part-financed by the European Regional Development Fund and the government of Malta. Through this work, the museum is to be enlarged by an additional 800 square meters and is to be re-organised in a chronological manner employing the best possible methods currently available in museum conservation and interpretation. This project will be completed by the end of the year. The museum is open to the public Tuesdays to Sunday 10 a.m. to 5 p.m.
A visit to this museum also combines the viewing of the original wartime documentary ‘Malta GC’ produced by the British Film Institute on the specific wish of King George VI who wanted to document the great ordeal that these islands were going through under siege in 1942. Also linked to the museum is an extensive air raid shelter which started off as a police air arid refuge in 1940 but which was later extended to offer shelter to hundreds of people.